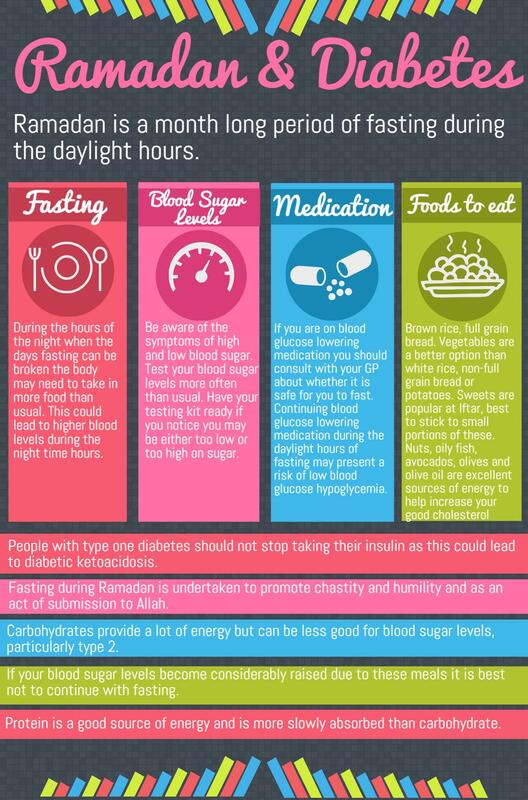 There is often discussion about whether people with diabetes should fast during Ramadan or not. Ramadan is a month long period of fasting during the daylight hours. Fasting during Ramadan is undertaken to promote chastity and humility and as an act of submission to Allah. Ramadan takes place on the 9th lunar month of the Islamic calendar. As a result, the date varies amongst the western (Gregorian) calendar. Is fasting with diabetes dangerous to health? Fasting during Ramadan could compromise one’s health. Those on blood glucose lowering medication should consult their GP about whether it will be safe for them to fast and what precautions can be taken to prevent blood glucose levels from going either too low or too high. Continuing to take blood glucose lowering medication during the daylight hours of fasting may present a particular risk of low blood glucose; hypoglycemia. During the hours of night, when the day’s fast can be broken, the body may need to take in more food than would normally be eaten, as a result, this may lead to higher blood glucose levels during the night time hours. People are recommended not to fast if the act of fasting could negatively affect their health. The charity, Diabetes UK, advises people with existing diabetic complications not to fast. People with type 1 diabetes should not stop taking their insulin as this could lead to a dangerous condition called diabetic ketoacidosis. However, fasting whilst continuing to take insulin could lead to hypos so people with type 1 should seek the advice of their consultant or diabetologist before taking part in fasting. Other people which may be exempt from fasting include pregnant women, the elderly and those suffering an illness. Those who cannot fast during Ramadan may be expected to donate meals to the poor and needy. You may wish to speak with your Imam about how best to respect the fasting period. Be sure to check with you doctor if you take part in the fast. It is advisable to test your blood sugar levels more often than normal through Ramadan. Be aware of the symptoms of high and low blood sugar. Have your testing kit ready if you notice you may be either too high or low on sugar. If you are taking blood glucose lowering medication, make sure you have a form of quickly absorbed sugar with you. See below for which foods are good options for eating at Iftar (the break of fasting). When the hours of daylight of over at dusk the fasting period is broken until dawn. It is important for people with diabetes to eat enough to keep nourished but to keep to healthy foods. Carbohydrates provide a lot of energy but can be less good for blood sugar levels, particularly for people with type 2 diabetes. Carbohydrates with a low glycaemic index such as brown rice, full grain bread and vegetables are better options than white rice, non-full grain bread or potatoes. Sweets may be popular dishes at Iftar but are not good for blood sugar levels. If you wish to consume sweets or ‘white carbohydrates’, it may be best to stick to much smaller portions of these. If your blood sugar levels become considerably raised as a result of these meals, it may be best not to continue with the fasting. Protein is a good source of energy and is more slowly absorbed than carbohydrate. People with signs of kidney damage should seek the advice of their doctor before significantly increasing the amount of protein they eat. Nuts, oily fish, avocados, olives and olive oil are excellent sources of energy and they help to increase your HDL (good cholesterol). These options are a great way to get the energy you need whilst keeping your blood sugar levels under control.